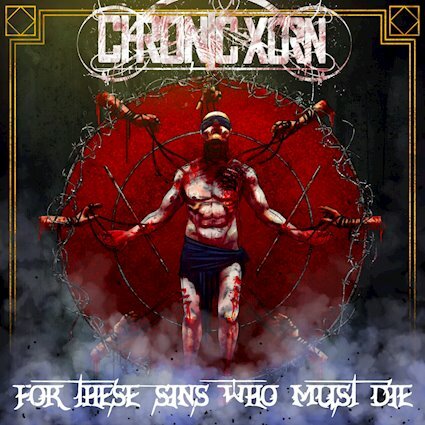 Chronic Xorn have been grinding hard for the last decade to become one of the premier acts in the Indian deathcore scene. With their second full length and third release overall hitting my ear drums now it becomes clear why it took the band five years to put out this record. It's the sort of massive statement that crushes your skull with riffs upon riffs. There is a certain sense of swagger and authority which comes with For these Sins Who Must Die, Chronic Xorn know who they are in this scene and deliver the punishment time and time again. I think what really gets me about this record is the mix of modern death metal and deathcore. the breakdown on a track like Justice by The Act Of Violence is an exciting counterbalance to more groove metal oriented ideas. Meanwhile there is a certain triumph to the manic almost At The Gates inspired riffing that defines a lot of these tracks. Of course -we don't have a lot to really sift through, with under thirty minutes of music and only five real songs. That being said - Chronic Xorn take advantage of the time they have to make a point about the state of the Indian extreme metal underground in 2018. There is something about this recotrd that I think speaks to the deathcore kid deep inside me, but also elements that reflect the metal fan I am today. there is a depth to the composition here that Chronic Xorn has never before had and which deathcore as a whole doesn't really embrace. It gives you something to really sink your teeth into despite the relatively short time frame. That all being said, For These Sins Who Must Die rapidly transforms into the sort of album that you want to spin again and again. Dig it.